NomadPlus is an innovative 2-in-1 charging solution. Idealfor travel, it adds a 1800mAh battery to any Apple USB wall plug - and it cancharge any smartphone or other USB powered devices. NomadPlus packs enoughpower to charge your phone 100% after you unplug it from the wall. From theManufacturer Backed by Experienced Investors. Made for each other NomadPlusfits perfectly with your existing Apple wall plug, allowing you to charge upyour phone with a cable as normal. While itâ€™s plugged in, it also charges upthe internal 1800mAh backup battery. Just unplug it and take it with you for abattery boost on the go. The smartest backup battery solution around At homeand on-the-go charging for all. NomadPlus take your Apple charger and adds an1800mAh battery for portable charging power Strong Steel reinforced. Impactresistant Durable Polycarbonate Oversized welds High Speed 2.4 amps supported.USB 2.0 data For power on the go You have a wall charger, but you need abackup battery. So why not use what you already have? 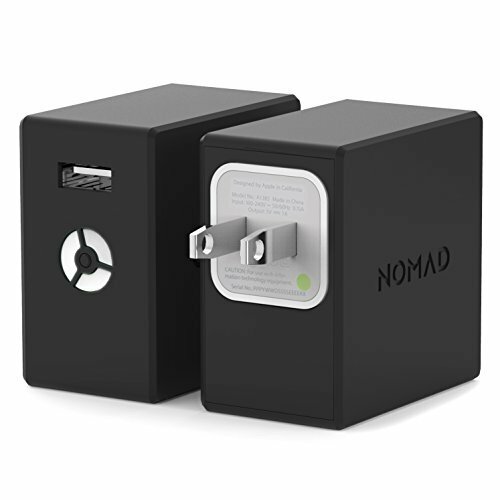 NomadPlus works withyour wall plug to turn it into a portable backup battery for on-the-gocharging. About the Startup Describe your product in 3 words. Wall ChargerUpgrade Where did you get the inspiration for your product? Anyone who owns aniPhone tends to have a couple of Appleâ€™s trusted wall chargers aroundâ€”and theyalso tend to need to charge both from the wall, and on the go. So we figuredthat upgrading a product you already own by adding battery to it would be agreat way to give some handy and renewed use to something you already owned.What differentiates your product from similar products out there? NomadPlus isthe only battery upgrade available for Appleâ€™s USB wall plug. It piggybacksoff of something you already own and creates a one of a kind portable powerbank. Tell us about the best and most challenging parts of the creationprocess. It was tough to get the hole just the right size for the Apple Plug,while being neither too tight to pull out or too loose causing the two partsto disconnect. To do this we built in a special rubber bumper to create justenough friction.